All about actor Timothy Olyphant bio, pics, videos and latest projects. Justified Season Five Episode Three aired January 21st. This week’s episode was titled “Good Intentions”. I enjoyed this week’s episode. Raylan feels like he is getting back to his old self. The wise cracking, ladies man that we love was in full swing this week. Raylan literally was in full swing as he takes a bat to a man in the name of chivalry. There was a lot of dealing and double dealing going on in this show. I am sure it will take the whole season to find out who is playing who. 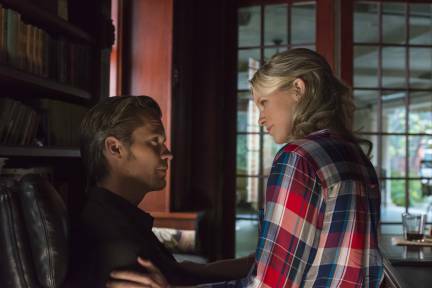 Raylan and Allison’s relationship heats up as they get hot and heavy on the stairs in Raylan’s new digs. It was reminiscent of his scene with Katie Holmes in “Go” minus the cat. The ladies get a treat when Raylan removes his shirt later in the bedroom. More of this please! Want to dress like Raylan? Check out these great boots! Their union is not to be completed much to Raylan’s surprise. Allison tells him she has to go when he returns, leaving him with an astonished look on his face. I both love and hate it when Raylan gets romantic. Let’s face it Raylan does not show good judgement when it comes to women. He tends to pick users of questionable moral character. So we are left to wonder about Allison. Was she using the guy to lure Raylan out of the house leaving her alone to retrieve something stashed inside? Rachel points out that very possibility to a reluctant Raylan. This leaves us to wonder if Raylan is getting lead down the rosy path once again. Later Allison tells Raylan the man is the father of a child she has placed in protective custody. This prompts the white knight in Raylan to visit the man and use his own baseball bat on him. He warns him to leave Allison alone after a few whacks, but not before the man accused Allison of planting drugs in his house. Meanwhile, the owner of the house, Monroe, is released from prison. He sends his “maid” to the house on a pretense of checking the coy pond. Raylan and Rachel discover that she has opened a safe containing gold. Outside Duffy’s man Mikey shoots and kills a man that he says drew a weapon on him. So is this Monroe’s man? Save 46% On Bulova Men’s Marine Star Navy Blue Dial Stainless Steel Watch Originally $299 Now $159.99 With Everyday Free Shipping! In the Ava and Boyd saga portion of the show, Boyd’s drug shipment is stolen. Dead bodies are all that are left behind. Boyd is left wondering who is stealing his drugs. His partner Duffy or one of his dealers. Boyd also snaps at Ava when she accuses him of not doing enough to get her out of prison. He tells her there is nothing legally he can do. She did kill Delroy and she was caught moving his body. Ava then leaves the room in anger but not before Boyd asks her for the second time to help him with finding a whore named Candy. Meanwhile Boyd and the Russian lady seemed to be headed for a tumble in the sack. Guess we will see how this plays out. Is she really double crossing her husband or is she playing Boyd? Amongst all this action, Dewey tries to rid himself of his cousin to no avail. Looks like Dewey is headed for more trouble when his cousin tells him to kill his bartender for stealing. Seems he has been skimming money for Boyd or so he claims. There is a myriad of cross and double cross in this episode. We can see the stories building up to the inevitable collision of all the players in one big showdown. But even though we know where we are going we still enjoy the ride. This episode was a strong one. It seems Jusitified has found its old stride and is off an running again. Even though they have obviously decided to step up the violence this year, it didn’t seem forced or over the top this time. I can’t wait to see what is in store for us in next week’s episode “Over the Mountain”. Give us your thoughts in the comments. We love to hear other fans take on things. This policy is valid from 22 July 2014 This blog is a personal blog written and edited by me. This blog does not accept any form of advertising, sponsorship, or paid insertions. We write for our own purposes. However, we may be influenced by our background, occupation, religion, political affiliation or experience. The compensation received may influence the advertising content, topics or posts made in this blog. That content, advertising space or post may not always be identified as paid or sponsored content. The owner(s) of this blog is not compensated to provide opinion on products, services, websites and various other topics. The views and opinions expressed on this blog are purely the blog owners. If we claim or appear to be experts on a certain topic or product or service area, we will only endorse products or services that we believe, based on our expertise, are worthy of such endorsement. Any product claim, statistic, quote or other representation about a product or service should be verified with the manufacturer or provider. This blog does not contain any content which might present a conflict of interest.